Links to previous previews: Welcome home Carlos – Everyone should be rooting for Leonys Martin – Will Jake Bauers make us forget Yandy Diaz? – Who’s replacing Yan Gomes? – Too many outfielders? Relievers and bullpen usage have been en vogue recently and the Tribe felt the positive effects of this in their 2016 and 2017 seasons. 2018 promised to be just as strong with Andrew Miller and Cody Allen returning to a seasoned bullpen. But it was not meant to be as both Miller and Allen would see a precipitous drop in their numbers leading the bullpen down an early season spiral that resulted in a 5.28 first half ERA – 2nd to last in the entire league. Acquisitions of Oliver Perez (June), Brad Hand and Adam Cimber (July) helped the tribe to a 3.75 second half ERA (9th in the league), but they only managed a 4.60 ERA on the season while their 17% home run per fly ball ranked dead last – and it wasn’t close. Addressing the bullpen was a huge need in season 2018 and is an even larger challenge coming into 2019. It is next man up time in Cleveland as replacing Allen and Miller will be a difficult task. Below is the list of relievers all but assured a roster spot due to either 2018 performance or contractual obligation. As we have seen in past seasons, the makeup will likely be fluid – but this group which will carry the torch for the Tribe to start 2019. Hand is the clear cut closer of this unit. Having revitalized his career in the “Andrew Miller” role for San Diego, he has also shown to be an effective closer converting 53 of 65 save attempts over the past two seasons. Hand started throwing more sliders in 2016 – supplanting his curveball and changeup – and the results have been spectacular. He is one of only two relievers to strike out 100 or more batters over the past three seasons (Dellin Betances being the other). He also has finished in the top 20 relievers in both strikeout and strikeout minus walk percentage the past two seasons. The result of this was a 2.75 ERA (2.28 with Cleveland) and 1.11 WHIP in 2018. The Indians will look to Brad Hand to anchor the back end of their bullpen for 2019 to offer stability where it was lacking early in 2018. Hand is more than capable of taking on this challenge. The numbers above flank players like Edwin Diaz, Kenley Jansen, Aroldis Chapman and Josh Hader – the top brass in relief pitching. At 37 years of age, OP is chasing time. It is unknown what he can repeat on the numbers he delivered in 2018, but he does not have to deliver at the same level to be valuable to this squad. He will likely be Tito’s go to in high leverage situations to start the season. Otero endured what is likely his worst season as a professional in 2018 – ranking in the bottom 15 in ERA, FIP and WAR and finishing dead last in HR/FB. Danny O’s performance is very much predicated on his ability to keep the ball in the park. He will not be a strikeout machine, but if he can induce ground balls, he will be effective. 2018 saw his ground ball rate drop 5% while his fly ball rate increased by 7% – a bad combination for a ground ball pitcher. The result was an HR/FB rate over 30% and a lot of hard-hit balls. To right the ship, Otero is going to have to get the ball on the ground and keep it in the park. Nothing in his profile suggests a drop off should be expected long term. In fact, his xFIP and SIERA numbers are in line with 2016 and 2017. It seems like a simple case of elevating a very hittable sinker which he throws two-thirds of the time. The key to Otero’s 2019 season will be his ability to keep the sinker down in the zone and induce more ground balls. He will likely be used in low leverage, middle relief to start the season until he instills confidence in Tito that he can keep the ball in the park. On the surface, Olson’s 2018 looks somewhat discouraging. Coming off a 2017 season where he allowed zero earned runs, Olson’s 4.94 ERA left a lot to be desired. However, his peripherals point toward a little bad luck and hopefully a rebound in 2019. An abnormally high HR/FB and BABIP helped to drive up his ERA, while an uptick in walks and decrease in ground balls did little to help. Despite this, a nearly 34% strikeout percentage helped drive a manageable 3.24 FIP. 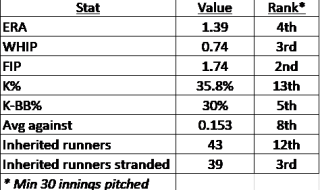 Olson fared better against left-handed batters striking out nearly 42% faced en route to a 2.56 FIP against lefties. While the sample size is small, it is an encouraging sign for Olson’s prospects as a lefty specialist in 2019 – precisely Olson’s projected role provided the rest of the bullpen is doing its job. Ramirez, much like Otero and Olson, fell victim to the long ball in 2018 – finishing in the bottom 15 relievers with minimum 30 innings pitched at nearly two home runs allowed per nine innings. Much like Otero and Olson, his 2019 success will depend on whether he can keep the ball in the park. His 28% strikeout percentage is serviceable, but his 10% walk percentage leaves much to be desired. Ramirez showed flashes of promise last season but as the year went on his walk rate and ERA both doubled. His right-side split does hint at him being more prone to eliminating righties – 12.98 k/9, 3.34 xFIP. If Ramirez can throw more strikes without yielding the long ball, he could maintain a spot in the pen. For now, he owes his spot as much to his contract as his performance. Cimber joined the Tribe along with Brad Hand in a July trade with San Diego. At the time of the trade, he had posted phenomenal numbers including a 9.5 K/9, 1.9 BB/9 and 2.33 FIP in 48 1/3 innings pitched. He closed the season on… let’s call it a down note. His K-rate was cut by a third, dropping to 3.1. His walk rate increased to 3.1, bloating his FIP to 6.06. Nothing in his batted ball profile suggests that he was hit any harder than with San Diego and his high BABIP with Cleveland (.324) was not much higher than in San Diego (.319). He also managed to increase ground balls in the process (65.8% vs 52.3%). A look deeper into the numbers shows that he threw less first pitch strikes (56.5% with Cleveland vs 67.2% with San Diego) while seeing his swinging strikes drop from 11% to 6%. To make it back to the reliable pitcher that Cimber was in the first half of 2018, he is going to have to strike out more batters and walk less. If he can keep the grounders up that will be a huge plus. Cimber’s role in the bullpen will likely be medium to high leverage to start the season – especially with a double play situation. Edwards is the biggest unknown in this group. He was out of baseball for nearly one year prior to signing a minor league contract with the Tribe in March of 2018. He brings primarily a fastball/slider mix, ramping his fastball into the mid to high 90s. Edwards pitched 8 2/3 innings for the Tribe last September posting a 3.12 ERA in limited action. The strikeouts have been there for Edwards, posting north of 9 K/9 at every stop he’s made. Unfortunately, he is also prone to walking batters at a high rate – at or above 5 BB/9 at every significant stop spare two. One of those stops happened to be AAA in 2018 where he boasted 12.6 K/9 and 2.7 BB/9 en route to a 2.30 FIP and 2.51 xFIP. He has kept the walks down this spring yielding only two in nine innings pitched. If he can keep a K/BB north of 4.5 I believe he could be a solid contributor to this bullpen. And aside of rooting for him on the baseball side, he’s also a cancer survivor who has worked his tail off to get to this point. I’ll be rooting for him this season. I expect to see Tito dip his toes in the water with Edwards early on this spring to test his ability to handle the high leverage situations. In all, the 2019 bullpen lacks the proposed strength it had 12 months ago – Hand is an upgrade to Allen, on paper Perez is not as strong as Andrew Miller. But the 2018 squad severely underperformed and in the end was bailed out by these very players. Otero and Olson are the only two returning to this unit from 12 months ago and both joined their 2018 peers in their underachievement. Should Otero and Olson right the ship this unit could prove to be an underrated asset to an elite rotation. Hand is the only known in the equation, but he is a strong one. If Perez can approach his 2018 performance they will pose a very strong closing force. Cimber and Edwards are still wildcards but either (or both) could emerge as a reliable high leverage reliever. Without pressure to shorten games, the bullpen should return to a more ancillary role in 2019 and hopefully save some gas in the tank for October. Chuck Chura is a husband, father, Tribe enthusiast and founder of The Jake Take Blog. He is a die-hard Cleveland sports and OSU fan who will contribute content on the Tribe.